If you are an artist, you are probably not on Twitter. I've been looking, daily seeking you out to follow you and learn about what you are doing. You're not there. Arts Organizations are on Twitter. The Walker Art Center (@walkerartcenter) is on Twitter. The Minneapolis Institute of Arts (@artsmia) is on Twitter. 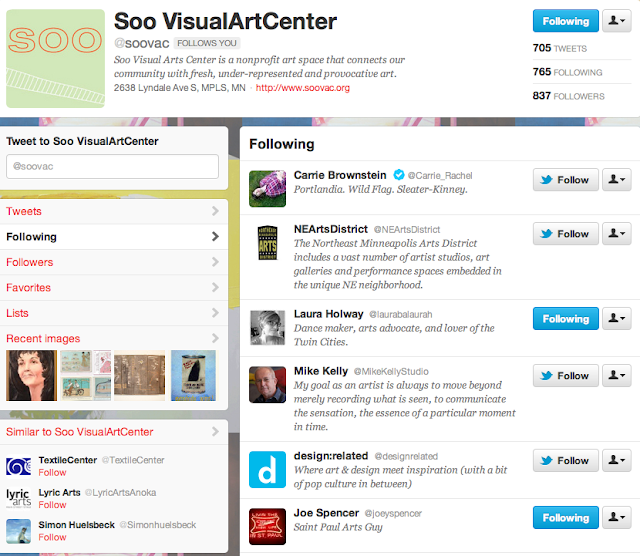 Even the Minnesota Artist Exhibition Program (MAEP) within the MIA is on Twitter (@arts_maep). All the community art centers like the Bloomington Theater and Art Center are on Twitter (@BloomingtonTAC), too. But most artists are not. Let me state as strongly as I can that if you are an artist, you need to be on Twitter. And I'm (@localartistint) going to help you get started. Account name / Twitter Profile / Twitter Handle = The name you have chosen for your account and is shown like, "@accountname". Tweet = The 140 character message you share on Twitter. 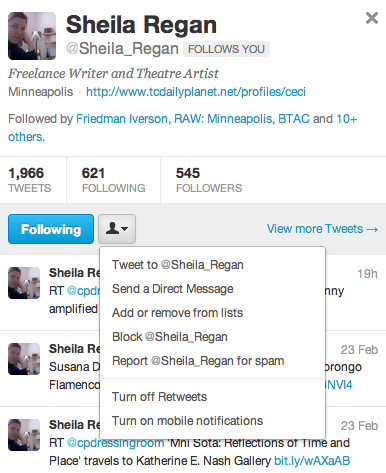 Follow = What you do so someone else's Tweets show up on your Twitter feed. Mention = When you want a specific person to see your tweet, you include their account name in your tweet and it will show up in the "Mentions" section of their account. It may look like, "The current @jehrapatrick show at @soovac is amazing." Now Jehra Patrick, artist, and SooVac Gallery will see that you have mentioned them, and everyone who follows both of them will also see your tweet. 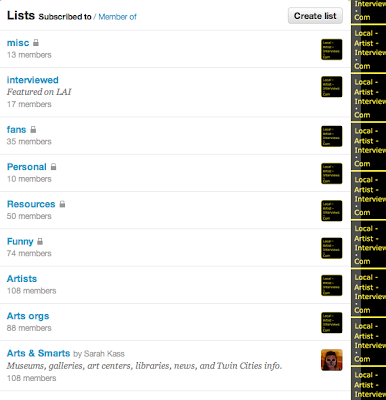 Lists = Categories that you create to organize the accounts that you follow into useful ways - Artists, Art Orgs, Comedians, Political, etc. Twitpic = Images uploaded to your Twitter page. Hashtags = "#"+whatever topic you want stay aware of. It may look like "#SXSW" when you want to see only tweets about the South By Southwest music festival. First, pick a Twitter Name. It should be as short as possible. I wish I chose a shorter one. Since you only have a 140 characters in a tweet, the shorter the better, when retweeting. I recommend names that directly describe you instead of something cryptic. If you are lucky enough to have @yourname available, take it! Update your profile. Describe yourself so others can know if they want to follow you. ALWAYS INCLUDE YOUR WEBSITE. Even if it is just your Facebook page or your MN Artists profile, have some sort of website link in your profile to help people find you when they want to learn more about you. Add a profile picture. If you do not add a profile picture, you will have a generic image of an Egg as your identifier. This is considered an amateur move and people will not "Follow" you. Your profile pic has a brand-like effect. People will begin to recognize you by your profile pic and pay attention. I think the best example from the people I follow is @albertbrooks, the actor/comedian. When I am scrolling through my Twitter Feed, I always stop when I see his orange profile pic with the sunglasses on them. Use an image of your face, your art, your logo, but you need to have a picture. Check out the other account settings. 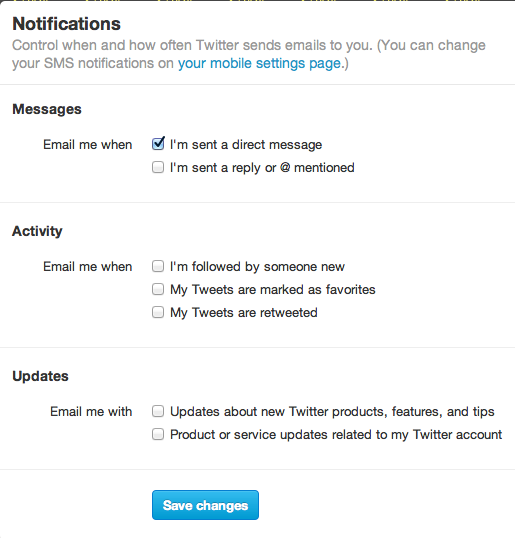 Most importantly, choose when you want to be notified by email of various Twitter activity. 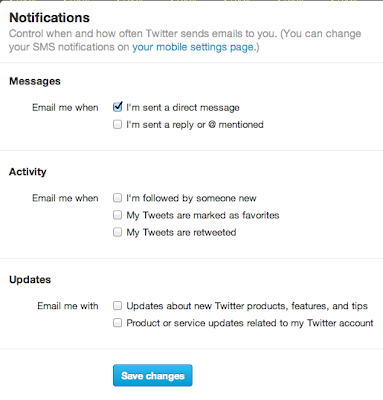 I used to have an email update every time someone mentioned me on Twitter. It clogged up my gmail inbox with information I could easily see whenever I logged on to Twitter. To each his own, though. Start Following People. Start with me (@localartistint) Check the Follow box and then click on Following and Followers on the left side of the page. Scroll through the lists and see if you want to follow any of the same people. I've collected a bunch of artists and arts organizations to help me stay up on the arts in Minnesota. Do this with other arts organizations, too. Maybe SooVac Gallery (@soovac) in Minneapolis. 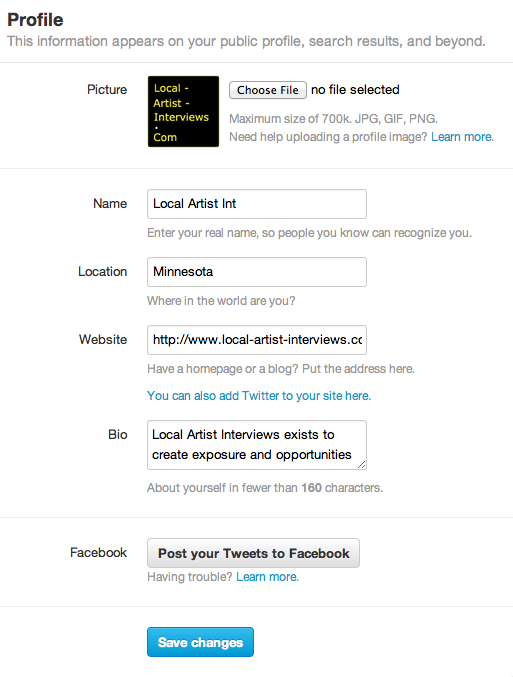 If you are an artist in Minnesota, you may be interested in following the people they follow. Eventually you are going to be following too many people to keep track of. in your Twitter feed you will see tweets from artists, organizations, products or stores you like, comedians, actors, politicians, family, and friends. Pretty much everyone but your mom. Your mom is not on Twitter. 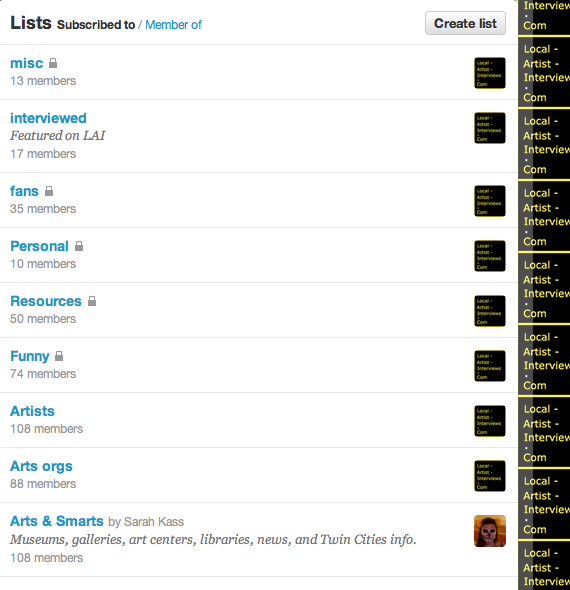 To help you sort through this mess, you will need to create lists. I suggest that before you start following people that you Create Lists for categories of people you plan to follow. At the least, I recommend one for Family, Friends, Artists, and Misc. When you Follow someone, click the little box that looks like a chess pawn which opens a drop-down box where you select "Add or remove from lists." Your list categories pop up and you check the appropriate box. So, when you just want to read your "Political" tweets, you can chose your "Political" list from your Twitter page and weed out all of the miscellaneous tweets that you wish to ignore. Follow people back. It is considered common courtesy to follow someone back when they follow you. You don't need to read their tweets if you don't want to, but it is all part of the networking that takes place on Twitter. The first person who followed me was Yoko Ono (@yokoono). My guess is that it was not because she is interested in me, but because I followed her first. Promote things for Local Artist Interviews: "Read a new interview with Kate Johnson @katereneesart (link to interview)"
Retweet: When you follow someone, they are going to tweet things you want other people to know about as well. When you hover your cursor over a particular tweet, you will see the option to Retweet. I love a good retweet. They help me learn about new people and resources to follow. And there you go. You will never wait in line the same way again!